My Darling Husband is coming home today! Have I mentioned this before? I’m still in awe that today is the day. The day that I’ve been waiting for, for a long time. for over two years, but we were living in Norfolk, Virginia. Now we will be living together in Ottawa. young man first visiting me in Canada from Tennessee, some 11 years ago – when I was just a girl and we were just kissy friends – he promised to one day return and make a home with me here. Little A. and I can barely contain our excitement. We are anxiously waiting for him to arrive! Were we staying or going? Going to be together now in this place we call home. So, it’s another day of celebrating and Little A. and I made chocolate cupcakes for the occasion. Today, my best friend & adoring husband is coming home. I couldn’t be any happier! It seems obvious enough that when you are married you should be physically together, but as many of you know, circumstance doesn’t always have it that way. And you have to overcome distance and separation to build your relationship and keep your love strong. For those of you who have done this, are doing this, and may do this the rest of your lives, you are so courageous and your love knows no boundaries or limitations. For those of you who have your loved one right beside you, be thankful that you do – even when they leave their wet towel on the floor… because when they’re not around, you really do miss everything about them. Today, I happily close the chapter on endurance. Lord knows it took such endurance to be apart from my soulmate for days on end. There will be new life lessons, there will be different struggles to overcome – but we will conquer them, together. Little A. gets to see his daddy in only a few hours and I get to wrap my arms around my Love…and together we get to rejoice, laugh, cry, jump for joy and eat cupcakes! 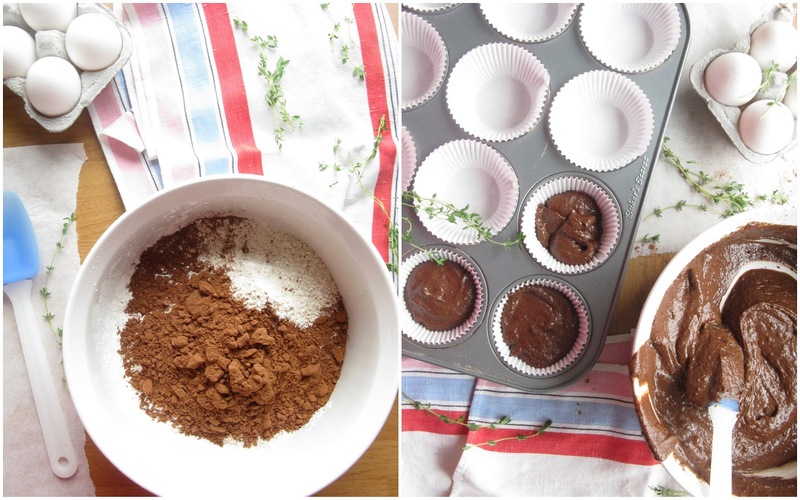 In a medium bowl mix together flours, cocoa powder, baking soda, baking powder. In a separate medium bowl, whisk eggs, add in sugar, olive oil. Pour into dry mix. Bake for 23-25 minutes at 350F. will have thickened and have a sticky, but liquid consistency. Let cool for 10 minutes. In a small mixing bowl blend together icing sugar and raspberry mixture. This will form your glaze. Dip cupcakes in the glaze, adding more with spoon/knife as desired. 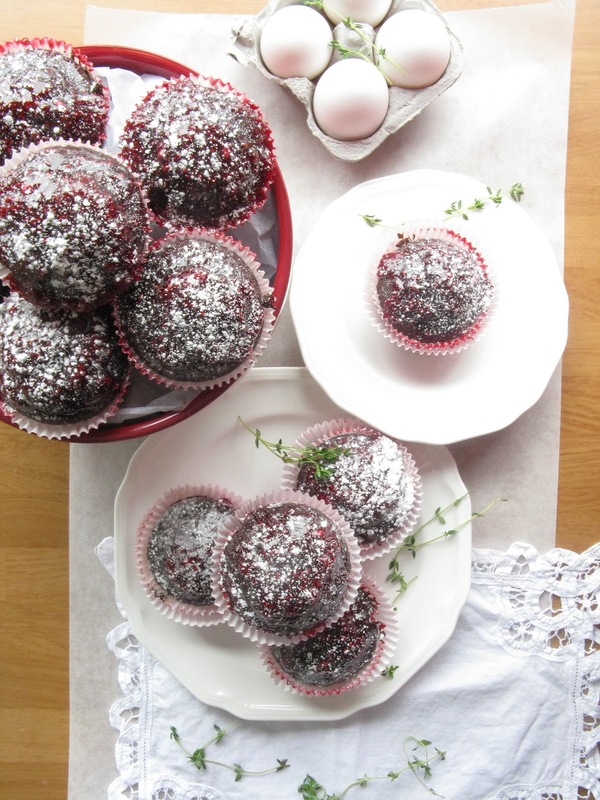 Before serving, dust with powdered sugar – and enjoy! I’m so happy this day has finally come! To see you push through and overcome all the hurdles it took to get here – it’s uplifting to know the glow of reunion is almost there! Cocoon yourselves for a while, but make sure to come back to us with that pure joy and enthusiasm that have at times been missing… love ya! Gosh these look absolutely delish. 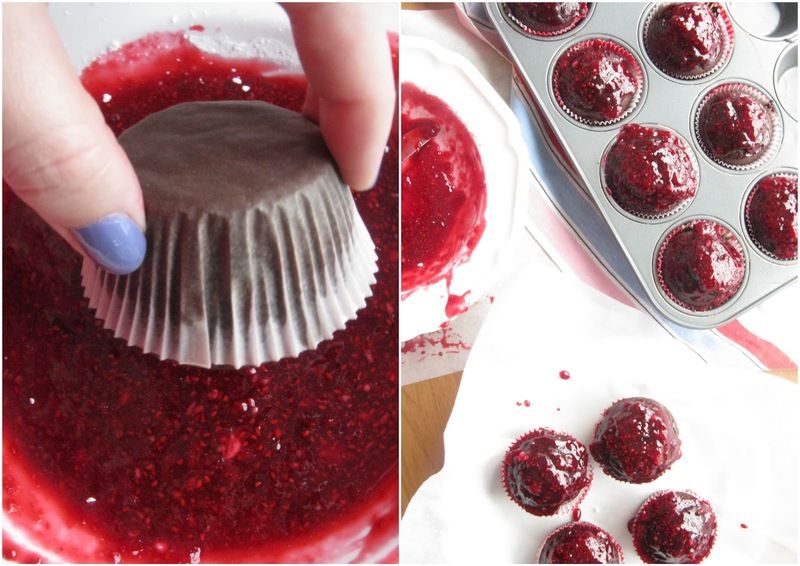 Chocolate and raspberry are an awesome combination. 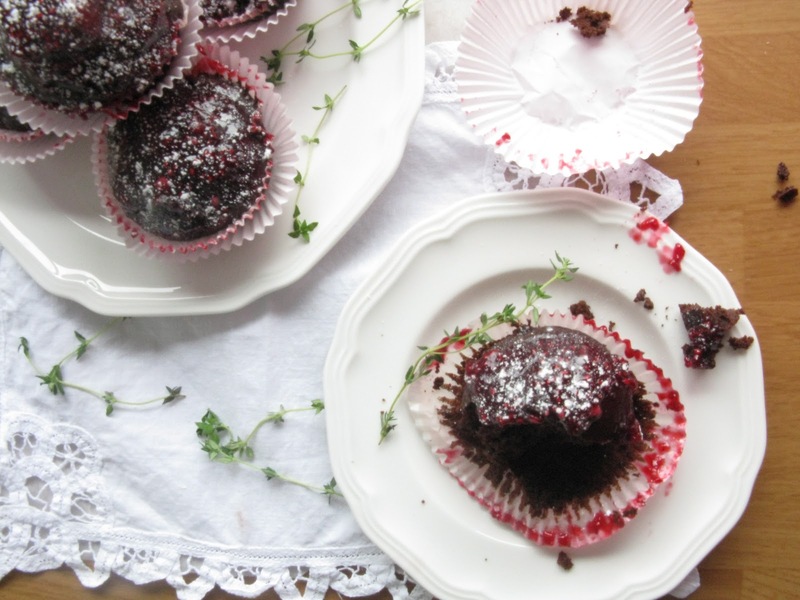 And these look so moist! Thanks for sharing. This day will be the one you remember for the rest of your lives. It will be the day that finally, your lives truly begin together. The past 2 years have only made you stronger and your hardened relationship will be able to tackle the hardest obstacles, the tallest of mountains. Enjoy this day. And when you are ready, we will all celebrate together, as friends. i love chocolates and love raspberries… the perfect combination!!! How wonderful! Enjoy every minute of your husband’s homecoming. A big thank you to him (and you! )for serving our great country! These look absolutely divine. You had me a chocolate raspberry! Emily, everything about this post is just wonderful!!! These cupcakes look SO SO good!! And I am so happy for you and your family!! So happy for you, your husband, and son! I’m sure your hubby will love the cupcakes- they look absolutely delish! By the way, Anthropologie is now selling a gluten free cookbook! I am so happy for you 🙂 It must have been so hard to be away from each other. Enjoy this moment and the cupcakes, yum! Thank you everyone for your love and support!! We are happily reunited and celebrating to the fullest. I’m so happy for you! the photos are AMAZING I don’t know how you styled it or got the colours to look so day-dream like. great job, and I bet your husband and little a loved those cupcakes! Lovely cupcakes! A great way to welcome your husband back. Praise God he is home! I am so happy this day has arrived for you and your little one. Enjoy every moment. These cupcakes look like the perfect welcome. what a GREAT post! i can’t even imagine how excited you are that your husband is coming home. i would miss mine like crazy should he have to be or live somewhere else. i have a friend in that situation too and i can hardly fathom it! also, those cupcakes look super delicious. also, yay for living in canada, and i adore ottawa. i don’t come across nearly enough canadian bloggers like myself! sorry for not being quick with a post but busy being kissy friends, the cupcakes where very tasty thanks sugar. I am so happy for you! Your cup cakes are amazing! Have a great weekend! oh Emily!!!!!!!!!!! at 1st i was all like ga-ga over the delicious display and then i read on to discover your tremendous news!!! now not that it discounts your awesome dish but dag is this ever an epic thing going on in your lives right now. i can just imagine the pure bliss cloud you’ve been floating along in and am overjoyed for you that he’s finally home! i literally cannot wait to hear more from you about what’s happened since you’ve all reunited and little A’s solace spot is finally here to stay too. These look so incredibly goooood!! Thank you everyone for your beautiful comments and lovely notes!